Effective concentration ED50 = 220 pM. Label Sulfo-NHS-LC-Biotin (~556 Da) was used for labeling human BDNF. The extent of labeling is 1-2 molecules of biotin per one molecule of human BDNF. The biotin is covalently conjugated to the N-terminus or to lysine residues present in human BDNF. Activity BDNF is a neurotrophic factor and binds p75NTR as well as TrkB receptors1,2. Tolkovsky, A. (1997) Trends Neurosci. 20, 1. Jing, S. et al. (1992) Neuron 9, 1067. Alomone Labs human BDNF-Biotin induces ERK1/2 MAPK phosphorylation in transfected HEK-293 cells as BDNF. 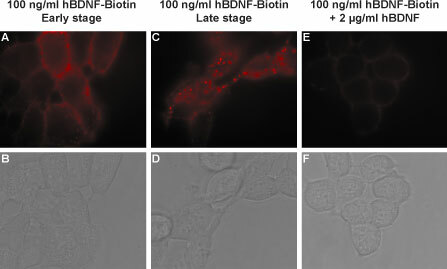 Transfected cells were serum depleted for 2 h, 3 days post-transfection and then challenged with 1 and 10 ng/ml Recombinant human BDNF protein (#B-250) or 1, 10 and 100 ng/ml human BDNF-Biotin (#B-250-B) for 10 min. The cell proteins were resolved by SDS-PAGE and detected with anti-phospho-ERK1/2. Alomone Labs human BDNF-Biotin induces ERK1/2 MAPK phosphorylation in mouse cortical neurons as BDNF. Mouse cortical neurons were starved for 4 h and then challenged with 50 ng/ml Recombinant human BDNF protein (#B-250) or human BDNF-Biotin (#B-250-B) for 30 min. 20 µg of the cell protein lysate were resolved by SDS-PAGE and detected with anti-phospho-ERK1/2 and anti-tubulin (the experiment was performed and the picture was kindly provided by Dr. Eran Perlsson, the Dept. of Pharmacology and Physiology, Tel-Aviv University). Alomone Labs human BDNF-Biotin binds TrKB receptors in living and stably transfected HEK293 cells and is displaced by un-labeled human BDNF. Living cells were incubated with 100 ng/ml human BDNF-Biotin (#B-250-B) in the absence (A-D) and presence (E,F) of 2 µg/ml Recombinant human BDNF protein (#B-250). Pictures were taken in early stages of the experiment (A-B) as well as in late stages (C-D) in order to show the accumulation effect of human BDNF-Biotin. human BDNF-Biotin was visualized using StrepAvidin-AlexaFluor-594. Similar results were observed using 10 ng/ml human BDNF-Biotin (data not shown). BDNF co-localizes with TrkB in mouse hippocampal CA1 region. A. Fixed brain sections were incubated with human BDNF-Biotin (#B-250-B) followed by Streptavidin-Cy3. B. Same sections were incubated with Anti-TrkB (extracellular)-ATTO-488 Antibody (#ANT-019-AG). 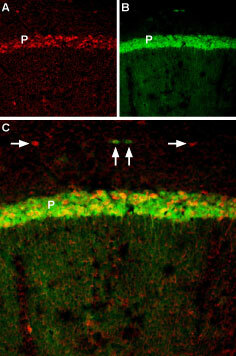 C. Merge of A and B reveals co-localization in the pyramidal layer (P). Outside the pyramidal layer, there are also cells with only BDNF (red, horizontal arrows) or only TrkB expression (green, vertical arrows). Pardridge, W.M. et al. (1994) Pharmaceut. Res. 11, 738. Zhang, Y. and Pardridge, W.M. (2006) Brain Res. 1111, 227. Du, J. et al. (2003) J. Cell Biol. 163, 385. Bhattacharyya, A. et al. (1997) J. Neurosci. 17, 7007. Song, X.Y. et al. (2008) PLoS ONE 3, e1707. Xie, W. et al. (2012) Integr. Biol. 4, 953. Few examples in the literature emphasize the importance of using BDNF-biotin in living cells experiments. Pardridge, W.M. et al. demonstrated that the delivery of BDNF to the brain is non-existent owing to the combined effects of neglible blood brain barrier (BBB) transport and rapid systemic clearance1. The brain delivery of BDNF may be increased by conjugating biotinylated BDNF to BBB drug delivery vectors, such as neutral avidin conjugated to murine monoclonal antibody to the rat transferrin receptor1. Zhang, Y. and Pardridge, W.M. further showed that when BDNF is formulated to enable transport across the BBB, the intravenous administration of BDNF results in the reduction in stroke volume and improvement in functional outcome2. Du, J. et al. 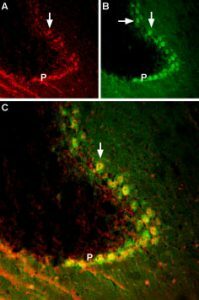 detected by using BDNF-biotin the ligand-induced TrkB internalization in cultured hippocampal neurons3. Bhattacharyya, A. et al. showed in mature sciatic nerves, that biotinylated BDNF activated Trk receptors function as rapid retrograde signal carriers to execute remote responses to target-derived neurotrophins4. Song, X.Y. et al. proved that exogenous BDNF-biotin is transported by the peripheral nerves following injection into the rat footpad and can be found in the sciatic nerves in fibres and vesicles5. Their data suggest that peripherally applied BDNF may have therapeutic effects on injured spinal cord. Xie, W. et al. followed the trafficking of QD-BDNF (Quantum Dot-BDNF) after its internalization at the axon terminal6. Their result showed that QD-BDNF could be used to track the movement of exogenous BDNF in neurons over long distances and to study the signaling organelles that contain BDNF6. TrkB binds to BDNF at the plasma membrane.Live TIRF imaging of TrkB-ACP-488 and labeled BDNF co-movement in HEK293T (HEK). Cells treated with streptavidin-647-labeled human BDNF-Biotin (#B-250-B) for 5 minutes and imaged at 8 fps. Arrowhead marks co-localized TrkB-BDNF particle. Scale bar = 2 µm. Right: color trace shows movement trajectory of TrkB-ACP-488 and BDNF-647 particles over time (blue- start, red- end of trajectory) Scale bar = 1 µm.Unpublished data from Zahavi, E.E. et al. (2018) Sci. Signal. 11, eaao4006. Figure generously provided by Dr. Eran Perlson, Dept. of Physiology and Pharmacology, Tel-Aviv University, Tel-Aviv, Israel. human BDNF-Biotin (#B-250-B) is a highly pure, recombinant, and biologically active conjugated protein. Zahavi, E.E. et al. (2018) Sci. Signal. 11, eaao4006.